The Padron Anniversario Serie 1926 debuted in 2002 to commemorate Jose O. Padron’s 75th birthday. Available in sun-grown natural or Maduro wrapper shades, these box-pressed cigars are made exclusively with 5-year-old Nicaraguan tobacco. This ensures maximum smoothness and complexity while flawless construction allows for a straight burn and generous draw. Try some for yourself and see why Padron Anniversario Serie 1926 earned the highest score of any non-Cuban cigar in Cigar Aficionado with an astonishing 97-percent rating. Good cigar, Padrón obviously speaks for itself, quality, taste, appearance, are all five star in my book! 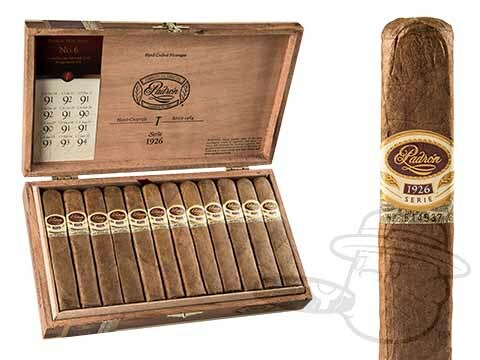 Padron Anniversario Serie 1926 #6 Natural is rated 4.6 out of 5 based on 3 customer ratings.